The equations for the light curves of comets that are currently visible use only the raw observations and should give a reasonable prediction for the current brightness. If the comet has not yet been observed or has gone from view a correction for aperture is included, so that telescopic observers should expect the comet to be fainter than given by the equation. The correction is about 0.033 per centimetre. Values for the r parameter given in square brackets [ ] are assumed. The form of the light curve is either the standard m = H0 + 5 log d + K0 log r or the linear brightening m = H0 + 5 log d + L0 abs(t - T + D0) where T is perihelion, t the present and D0 an offset, if L0 is +ve the comet brightens towards perihelion and if D0 is +ve the comet is brightest prior to perihelion. Comet 21P/Giacobini-Zinner, the parent comet of the October Draconid meteors, should be visible from August until the end of the year, brightening from 14m to 9m. It is an evening object and at its best at the end of November. Starting off in Hercules and accelerating into Aquila, it then moves through the zodiacal constellations of Capricornus and Aquarius. An increasingly southern declination means that UK observers will loose it towards the end of the year. The comet was first discovered by Michael Giacobini at Nice observatory in December 1900 and was thought to have a period of 6.8 years. The next two returns were expected to be difficult to observe, but in October 1913, Ernst Zinner, of Bamberg, Germany, discovered a comet whilst observing variable stars in Scutum. This turned out to be the same comet, but the period had been incorrectly determined. The comet was missed at three unfavourable returns, so this will be the thirteenth apparition of the comet. The comet is currently around 9th mag and readily visible to UK observers. Martin Mobberley imaged the comet on October 14 and October 25 . Observations in ICQ format, last observation 1998 October 26, updated 1998 November 4 . Comet 29P/Schwassmann-Wachmann 1 is now in conjunction. Andrew Pearce reports glimpsing it at 14th mag in his 0.41-m reflector at the end of December 1997. Further reports suggest that the comet brightened to around 12th mag visually and then faded to 14th mag. The second outburst of the year commenced in mid March according to IAUC 6844 and the comet is now around 13th mag, though I was unable to see it on April 28.9, when it was fainter than 13.2. It may be undergoing another outburst at around 13th mag (May 30). This annual comet has frequent outbursts and over the past couple of years seems to be more often active than not, though it rarely gets brighter than 12m. It is possible that its pattern of behaviour is changing. In early 1996 it was in outburst for several months. The randomly spaced outbursts may be due to a thermal heat wave propagating into the nucleus and triggering sublimation of CO inside the comet. The comet will be observable in Libra for the rest of the year. This comet is an ideal target for those equipped with CCDs and it should be observed at every opportunity. Observations in ICQ format, updated 1998 May 21 . Comet 43P/Wolf-Harrington is now too faint for visual observation at this return. This was the ninth observed return of the comet, which was discovered in 1924, then lost until 1951. The comet is in a chaotic orbit, and made a close approach to Jupiter in 1936 which reduced its perihelion distance from 2.4 to 1.6 AU. At the last return the comet reached 13m. Observations in ICQ format, last observation 1998 January 31, updated 1998 February 4 . Comet 52P/Harrington-Abel was found in outburst at 12th mag by Alain Maury, Observatoire de la Cote d'Azur, on CCD images taken on July 21.1 UT when its predicted magnitude was about 21. [IAUC 6975, 1998 July 25]. It is currently visible in the morning sky at around 13th mag (October 18), but is slowly fading despite its decreasing distance from the sun, with perihelion not occuring until 1999. A second outburst may have occured some 80 days before perihelion. Observations in ICQ format, last observation 1998 November 1, updated 1998 November 4 . Comet 62P/Tsuchinshan 1 is no longer visible at this apparition. Observations in ICQ format, last observation 1998 May 19, updated 1998 October 5 . Comet 69P/Taylor was brighter than expected, reaching 12th mag. A series of Jupiter encounters last century reduced q from 3.1 to 1.6 AU and led to its discovery by Clement Taylor from South Africa in December 1915. It was quite bright, 9th magnitude at best, and shortly after perihelion split into two fragments, each with a short tail. The secondary nucleus became brighter than the primary, but then rapidly faded and the primary also faded more rapidly than expected. The comet was then lost until 1977, when new orbital computations led to the recovery of the B component by Charles Kowal with the Palomar Schmidt. The A component was not found. Observations in ICQ format, last observation 1998 May 31, updated 1998 October 5 . Comet 78P/Gehrels 2 is now too faint for visual observation. Observations in ICQ format, last observation 1998 February 2 (or possibly April 24), updated 1998 June 26 . Comet 88P/Howell With a low inclination orbit, the comet sticks to the zodiacal constellations and can be found in Scorpius at perihelion, moving onwards to Capricornus at the end of the year. UK observers will loose it after early June, after which it belongs to more southerly located observers. The comet was discovered in 1981 by Ellen Howell with the 0.46-m Palomar Schmidt. It passed 0.6 AU from Jupiter in 1978, which reduced the perihelion distance, but the biggest change to its orbit occurred in 1585 when an encounter reduced q from 4.7 to 2.4 AU. I made a tentative observation of the comet on May 29.95, estimating it at 13.5: with the Northumberland refractor. My observations prior to mid May appear unlikely and should be treated as upper limits. Recent observations put it at around 10th magnitude. It seems to be another comet with a linear light curve peaking after perihelion. Observations in ICQ format, last observation 1998 October 19, updated 1998 November 4 . Comet 93P/Lovas 1 is slowly brightening and is currently around 14th mag. Comet 103P/Hartley 2 is now too faint for visual observation. Comet 104P/Kowal 2 is no longer visible this apparition. Comet 1995 O1 Hale-Bopp is visible in the evening sky in large binoculars for observers south of the equator. It was a 'great comet', though in some ways comet Hyakutake made a greater impression with its long straight gas tail. The most recent observations by Albert Jones, using a large reflector put it at 10th mag, whilst those by Jose Aguiar give around 9.5 in a 0.23-m reflector. There are significant variations from this, and the comet is currently nearly a magnitude fainter than indicated by this equation. For more information on the comet see the CBAT or ESO pages. 1995 observations (9kb) / 1996 observations (113kb) / 1997 observations (Jan - April) (126kb) / 1997 observations (May - December) (38kb) / 1998 observations (10kb) in ICQ format, last observation 1998 August 5, updated 1998 October 5. 1997 BA6 Spacewatch Details of the orbit of an unusual asteroid, 1997 BA6 were given on MPEC C-13. The orbit is very eccentric, with a period near 4500 years and a semi-major axis of several hundred AU. This is more typical of a long period comet and subsequent observations with large telescopes showed a small faint coma. Currently it is nearly 16th mag and will be at high southern dec when near perihelion. It is heading for perihelion at 3.4 AU in 1999 December when it may be around 12th mag. 1997 D1 Mueller was discovered on plates taken by Jean Mueller for the 2nd Palomar Sky Survey with the 1.2m Oschin Schmidt Camera on 1997 Feb 17th. The object was reported as 16th mag, but appeared brighter to visual observers. It is no longer within visual range. 8.0 + 5 log d + [7.5] log r until October, followed by a fade of around 0.5 magnitude per month. 55P/Tempel-Tuttle (1997 E1) was recovered by observers using the Keck 10m telescope and confirmed using the ESO 3.5m NTT at mag 22. It passed relatively close to the earth in late January, but is now receding from us and the sun. It is no longer observable at this return. Here is some historical information on the comet. 1997 G2 Montani was announced on IAUC 6626. It is an 18th mag object, again reported by Joe Montani of the Spacewatch team. The comet was predicted to brighten to 16th mag at perihelion in April. 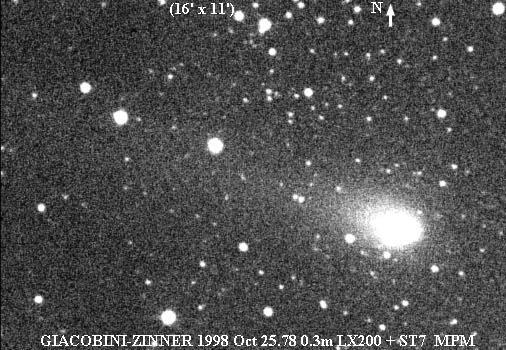 1997 J2 Meunier-Dupouy French amateur Michel Meunier reported a comet 6' SW of 1997 J1 on 1997 May 7.9, moving more slowly and perhaps 0.5 mag brighter. Independently another pair of French amateurs P Dupouy and J F Lahitte reported it the next day. The comet is quite distant. The comet is at a good solar elongation, though rather too low in the sky for UK observers. The comet seemed significantly fainter on August 6.1 when I made it 13.0. It seems to appear brighter in reflectors and on August 14.9 I made it 12.0 in my 0.33-m L x75. The observations are fairly well scattered. 1997 T1 Utsunomiya Syogo Utsunomiya of Azamihara, Minami-Oguni cho, Aso-gun, Kumamoto-ken, Japan visually discovered a mag 10.5 comet, strongly condensed with a 2' coma diameter using 25x150B on October 3.6. [IAUC 6751, 1997 October 5]. The comet should have been brighter than 12th mag throughout 1997 September and may be visible on patrol photographs. It is no longer visible. were discovered with the SOHO LASCO coronographs and have not been observed elsewhere. They were sungrazing comets and were not expected to survive perihelion. More 1997 SOHO comets have been reported on IAUC 6811, IAUC 6813, IAUC 6825 and IAUC 6837. SOHO-54 and 55 were visible on the same images. The initial uncertainty in the orbit of 1998 J1 suggests that there may be a problem with the transfer of the co-ordinate reference frame from the LASCO coronographs. C/ designation of any new objects will not be made until accurate positions and hence orbits are available. Information about the latest discoveries is available from LASCO comet observations web site. SOHO experienced a malfunction on 1998 June 25 and contact with it was lost. It was located by radar on July 29, communication was established in early August and it resumed pointing at the Sun in mid September. The LASCO cameras were reactivated in October so there is the possibility that it may discover more comets, and some may also be found on archival images. There are three LASCO (Large Angle Spectroscopic Coronographs) on the SOHO spacecraft. C1 has a field from 1.1 to 3 solar radii, C2 from 1.5 to 6 and C3 from 3.5 to 30. Brighter objects are often discovered in the real time data, but the fainter ones have to wait for the archival data to be searched which runs three or four months behind. SOHO has now discovered 55 comets (5 were not sungrazers), and they are probably not all members of the same Kreutz group. Further background information on the SOHO comets can be found from the LASCO comet observations web site. If you look at the LASCO real-time movies, you will see the latest 2 bright sungrazers in the C2 field at the same time. 1998 B1 135P/Shoemaker-Levy 8 has been recovered by Carl Hergenrother with the SAO 1.2-m reflector at Mt Hopkins on January 22 when it was 22nd magnitude [IAUC 6821, 1998 February 9]. The comet is unklikely to become bright enough for visual observation. 1998 G1 P/LINEAR was discovered during survey work by the Lincoln Laboratory Near Earth Asteroid Research Project using the Lincoln Laboratory ETS 1-m f2.15 reflector on April 2.13 [IAUC 6863, 1998 April 6]. The asteroidal object had a retrograde near parabolic orbit and further images by Warren Offutt of Cloudcroft, New Mexico showed a tail but no coma. Further observations have shown that it is in a Halley type orbit, with a period of 41.5 years. The comet was around 18th mag, but won't become much brighter than 17th mag as the return is not a favourable one. This SOHO comet (SOHO-47) was not a Kreutz sungrazer, and faded very rapidly. A movie of it can be seen on the LASCO pages and there is more information at the LASCO comet observations web site. Patrick Stonehouse of Wolverine, MI, USA, reported a visual discovery, using a 0.44-m relector, of a diffuse comet with slight condensation on April 22.3. He was observing in Serpens Caput and noticed a diffuse object which showed motion. There was some confusion over the reported motion, but it was eventually confirmed by Alan Hale on April 26.3 [IAUC 6883, 1998 April 26]. The discovery magnitude was given as mag 12 - 13, though Alan Hale put it at 10.7. I observed it with the Northumberland refractor x100 on April 28.08 and made it 11.7, coma diameter 1.1', DC s3. Nick James imaged it on April 28.9 and this shows a faint tail to the south. Despite moonlight I was able to observe it with the Northumberland refractor on May 3.88, making it 12.1, DC3 and diameter 1.1'. I was unable to see it on May 29.96, making it fainter than 13.4. This SOHO comet has become the first to be observed other than by the satellite. It was discovered by Shane Stezelberger on C3 coronagraph images on May 3 [IAUC 6894, 1998 May 5]. Initial magnitude estimates put it at magnitude 0 or brighter, with a fan-shaped tail, some 8 degrees from the sun, however ground based measurements suggest it is fainter than initially estimated. It is now fainter than 12th mag. Jean Mueller discovered another comet during the 2nd Palomar Sky Survey on May 16.2 with the 1.2-m Oschin Schmidt. [IAUC 6908, 1998 May 18]. It is 16th mag and expected to fade, though the initial orbit is rather uncertain. 1998 K2 LINEAR was one of 37 fast moving objects discovered during survey work on May 24 by the Lincoln Laboratory Near Earth Asteroid Research Project using the Lincoln Laboratory ETS 1-m f2.15 reflector at Socorro, New Mexico. The MPC were able to link it with one of 25 fast movers discovered two nights earlier. [IAUC 6915, 1998 May 25]. The object was reported at 16th mag by LINEAR, but other observations have put it as bright as 13th mag. It is at high southern declination and is at perihelion in September and will be around 13th mag. 1998 K3 LINEAR was another fast moving object discovered during survey work, on May 23, by the Lincoln Laboratory Near Earth Asteroid Research Project with the ETS 1-m f2.15 reflector. On sending the first confirmatory observations on May 24.5 UT, F. B. Zoltowski (Woomera, 0.3-m Schmidt-Cassegrain) remarked on the "poor" nature of the images, and on May 25.5 he added that they were diffuse and difficult to measure (unlike those of the six other LINEAR objects he also observed at that time). Initial orbit computations at the Minor Planet Center suggested that the orbit was retrograde. In response to their request, M. Tichy (Klet, 0.6-m reflector), observing on May 25.9, also remarked that the object seemed slightly diffuse (coma about 8"). In better conditions on May 26.2, W. B. Offutt (Cloudcroft, 0.6-m reflector) remarked on a faint coma, some 3" in diameter, and a faint, but discernible, tail extending about 10" from the central condensation in p.a. approximately 120 deg. S. Nakano reports that A. Sugie (Dynic, 0.6-m reflector), observing on May 26.6, independently noted the object's cometary nature, with a 6"-8" coma and a 6" tail to the east. [IAUC 6916, 1998 May 26]. The object is 17th mag and will fade. was recovered on May 24.4 by J. V. Scotti of the Lunar and Planetary Laboratory, with the Spacewatch telescope on Kitt Peak. The comet, of mag 21, is very slightly diffuse, with a coma diameter of 12" on May 26.45 UT. The indicated correction to the prediction by S. Nakano on MPC 27081 is Delta T = -0.7 day. [IAUC 6919, 1998 May 26]. 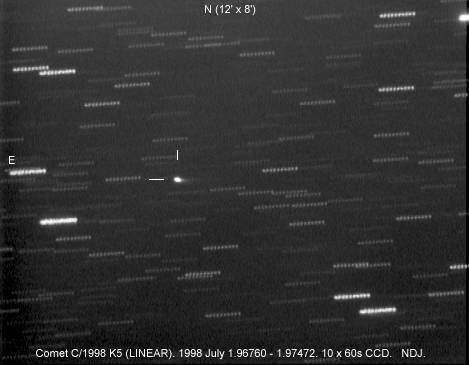 1998 K5 LINEAR is yet another fast moving object discovered during survey work, on May 26, by the Lincoln Laboratory Near Earth Asteroid Research Project with the ETS 1-m f2.15 reflector. The high orbital eccentricity indicated in the early computations was the first clue that the object might be a comet, although there were the complications that the orbit has a low inclination and that, when asked, several observers felt that their data showed the object to be asteroidal in nature. The first observational indication of cometary character was provided by P. J. Shelus, who remarked that images obtained by J. G. Ries (McDonald, 0.76-m reflector, poor seeing) on May 29.39 UT seemed to show a tail to the south and west, roughly opposite the object's direction of motion. P. Pravec (Ondrejov, 0.65-m reflector) also remarked on the tail, consistently on co-added images and marginally on individual images, 0'.4 long in p.a. 235 deg on May 27.03, 0'.4 long in p.a. 225 deg on May 28.95 and 0'.3 long in p.a. 227 deg on May 29.97. On May 30.46 C. Veillet (Canada-France-Hawaii, 3.6-m reflector) noted a clear 30" tail on a 1-min exposure . S. Nakano reports that A. Sugie (Dynic, 0.6-m reflector, bad seeing), observing on May 27.58, independently noted (on four coadded frames) a 16" tail in p.a. 230 deg. [IAUC 6923, 1998 May 30]. The comet has a perihelion distance just inside the Earth's orbit, but is intrinsically very faint. The latest orbit gives a period of around 600 years. I observed it on June 20.0 and was surprised how easy it was to see and how rapidly it is moving. I estimated it at 12.9 in the Northumberland x170. The motion was obvious within a minute - absolutely fascinating! It was a similar magnitude on June 21.0 and essentially stellar in appearance. Its appearance was little changed on June 28.98. 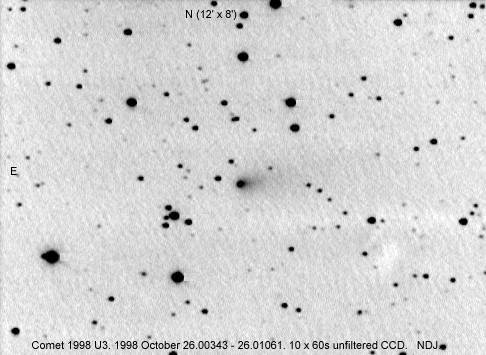 Nick James obtained a CCD image of the comet on July 1.98. It was still an easy object on July 22.1 when I made it around 13.3. It hadn't changed much in appearance by August 23.1 and was only a little fainter though a little more diffuse in mid October. By the end of October it was still 14th mag, but becoming larger and more diffuse. The light curve is very unusual and the comet's absolute magnitude seems to have peaked some 60 days after perihelion. 1998 K6 137P/Shoemaker-Levy 2 was recovered by C. W. Hergenrother with the Smithsonian Astrophysical Observatory's 1.2-m reflector at Mt. Hopkins on May 19. The comet appeared stellar at 21st mag, although the observations were made through moderate cirrus. The indicated correction to the prediction by S. Nakano on MPC 29881 is Delta T= -0.5 day. [IAUC 6928, 1998 June 2]. 1998 M1 LINEAR was discovered during survey work by the Lincoln Laboratory Near Earth Asteroid Research Project using the Lincoln Laboratory ETS 1-m f2.15 reflector on June 16.2 [IAUC 6940, 1998 June 16]. CCD observations suggest it is around 16th mag, but it could be brighter to visual observers. The comet will fade. 1998 M2 LINEAR was recorded during survey work by the Lincoln Laboratory Near Earth Asteroid Research Project using the Lincoln Laboratory ETS 1-m f2.15 reflector on May 28.4 and discovered to be cometary on June 19.3 [IAUC 6949, 1998 June 20]. CCD observations suggest it is around 15th mag, but it could be a little brighter to visual observers. The comet will slowly fade. 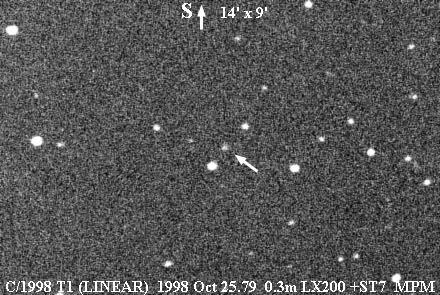 1998 M3 Larsen was discovered by J Larsen with the 0.9-m Spacewatch telescope on June 24.3 but prediscovery observations made by LINEAR were found in images taken on May 26.3. The comet is very distant with perihelion at 5.8 AU. It is around 18th magnitude and expected to fade. 1998 M4 LINEAR was discovered during survey work by the Lincoln Laboratory Near Earth Asteroid Research Project using the Lincoln Laboratory ETS 1-m f2.15 reflector on June 25.3 [IAUC 6954, 1998 June 27]. The comet is 17th mag (though possibly 14th or 15th mag to visual observers) and will fade. 1998 M5 LINEAR was discovered during survey work by the Lincoln Laboratory Near Earth Asteroid Research Project using the Lincoln Laboratory ETS 1-m f2.15 reflector on June 30.3 [IAUC 6959, 1998 July 1]. I made it 13.7 on July 22.1. In an observation on July 30.9 somewhat spoilt by cloud I estimated it at 13.3:. On August 24.9 I made it 12.5, DC4 in my 0.33-m L x75, a little brighter than in the large refractor. Martin Mobberley imaged the comet on September 21 . By mid October the comet had brightened to around 11th mag. The comet was at perihelion in January and passed very close to the pole in mid March, when it was imaged by David Strange. Heading south it passed through Camelopardalus and Lynx, reaching Cancer mid year when it had faded to 13th magnitude. It is too faint and close to the sun for further observation. Observations in ICQ format, last observation 1999 November 4, updated 1999 November 29. 1998 M6 Montani was announced on IAUC 6960 [1998 July 1]. It is a 19th mag object, discovered visually by Joe Montani on the display monitor during the course of routine Spacewatch observations with the 0.9-m telescope. The comet is a distant one and is expected to fade. 1998 O1 138P/Shoemaker-Levy 7 was recovered by J. V. Scotti, Lunar and Planetary Laboratory, with the Spacewatch telescope on Kitt Peak on July 25.4 [IAUC 6979, 1998 July 27]. The comet was around 21st mag. The indicated correction to the prediction by B. G. Marsden on MPC 25183 was Delta T = -0.7 day. The comet is not expected to become significantly brighter. 1998 P1 Williams Peter Williams of Heathcote (near Sydney) made a visual discovery of a new comet using a 0.30-m f/6 reflector (72x) on August 10.5. [IAUC 6986, 1998 August 11]. I was able to observe it in 10x50B on several occasions in August and September 1998 whilst on a visit to Australia and New Zealand, making it around 7.5. It was observed from the UK after perihelion. It is no longer visible. Observations in ICQ format, last observation 1999 May 12, updated 1999 August 12. 1998 Q1 LINEAR was discovered during survey work by the Lincoln Laboratory Near Earth Asteroid Research Project using the Lincoln Laboratory ETS 1-m f2.15 reflector on August 24.3 [IAUC 6995, 1998 August 25]. The comet is 15th mag and will fade. 1998 S1 P/LINEAR-Mueller was discovered by Jean Mueller on October 17 on a 30-min exposure taken on Oct 14 with the 1.2-m Oschin Schmidt telescope at Palomar by K. Rykoski and Mueller in the course of Palomar Outer Solar System Ecliptic Survey. The comet was confirmed on Oct 17 and Gareth Williams later identified it with minor planets observed by LINEAR on Sept 26 and 27 and LONEOS on Sept 17. The comet is of short period and had a close approach to Jupiter in 1992. [IAUC 7031, 1998 October 19]. The comet is 14th mag and will fade. A/1998 SV4 This asteroid has a very short period of 0.74 years, with a high inclination and a perihelion distance of 0.3AU. It reaches perihelion in 2001 May. 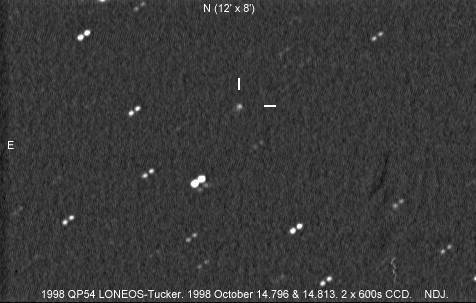 1998 T1 LINEAR was discovered during survey work by the Lincoln Laboratory Near Earth Asteroid Research Project using the Lincoln Laboratory ETS 1-m f2.15 reflector on October 2.3 [IAUC 7026, 1998 October 8]. The comet was one of 17 fast-moving asteroidal objects discovered on October 2, but appears to be a long-period comet, according both to the retrograde nature of its orbit and remarks by Y. Ikari (Moriyama, Japan) concerning the object's appearance, when he observed it on Oct. 3 and 8 in response to a request on The NEO Confirmation Page. 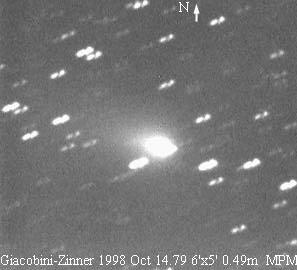 Martin Mobberley obtained this image of the comet in 1998. Seiichi Yoshida recovered the comet in late April after conjunction but its magnitude was fainter than expected in his CCD images. It brightened and reached 9th mag in late June, but it has now faded below visibility. Observations in ICQ format, last observation 1999 July 31, updated 1999 August 31. 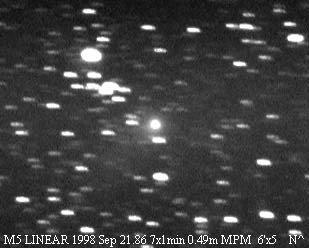 1998 U1 LINEAR is yet another comet discovered by LINEAR. The object, discovered on Oct. 18, was reported as asteroidal and fast-moving, and a request for further observations was placed on The NEO Confirmation Page. From the confirmatory observations, made at four observatories on Oct. 20 and 21, it quickly became clear that the object had a retrograde, nearly parabolic orbit. Referring to the observations made with the 0.65-m f/3.6 reflector at the Ondrejov Observatory on Oct. 20.9 UT, P. Pravec notes that a faint tail was visible on individual 3-min exposures with a clear filter. The tail, extending 16" in p.a. 60 deg, was confirmed on co-addition of six frames. [IAUC 7033, 1998 October 21]. The comet is faint and distant and past perihelion. 1998 U2 P/Mueller 6 was discovered by Jean Mueller on plates taken by herself on Oct 21.3 (and with K. Rykoski on Oct. 22) with the 1.2-m Oschin Schmidt Telescope in the course of the Palomar Outer Solar System Ecliptic Survey. The comet has a strong condensation and a short, faint tail to the southeast. [IAUC 7035, 1998 October 22]. Prediscovery images from September 14 were found in LONEOS data and the comet is an intrinsically faint periodic object found at a favourable opposition. 1998 U3 P/Jager was discovered by Michael Jager on 16- and 9-min Technical Pan film exposures with a 0.25-m f/2.8 Schmidt camera. The comet has a 1'-2' coma with condensation and a tail several arcmin long in p.a. 275-281 deg and is around 12th mag. [IAUC 7038, 1998 October 25]. It is at perihelion in early December and will brighten a little before slowly fading. I observed it on October 29.1, making it around 12.5 in the Northumberland refractor x105, DC s3 and diameter around 1'. Nick James imaged the comet on October 26 Observations with the Northumberland in March put the comet at 12 - 13th magnitude. Observing on April 9/10 I could barely see the comet in the Northumberland, estimating it 13.6. 1998 U4 P/Spahr 1 was discovered by Timothy B Spahr of the University of Arizona on October 27.4 on CCD images taken with the Catalina Sky Survey 0.41-m f3 Schmidt. It is 17th mag and was confirmed by Spacewatch Telescope images. [IAUC 7042, 1998 October 29]. The preliminary orbit is a distant elliptical one and the comet will not become any brighter. 1998 U5 LINEAR another object discovered by LINEAR has been identified as a comet. [IAUC 7044, 1998 October 31]. Preliminary orbit determinations suggest that it will brighten a little further over the next few weeks. On 1998 November 1.18 I estimated it at 12.3, rather brighter than 1998 U3. It is no longer visible. Observations in ICQ format, last observation 1999 June 4, updated 1999 June 14. 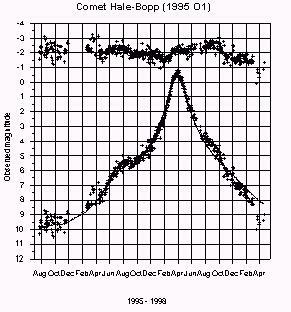 1998 VS24 P/LINEAR On further examining the Nov. 10-11 observations, published on MPS 3154, of an apparently unremarkable asteroidal discovery from the LINEAR program, G. V. Williams made identifications with isolated sets of observations from Visnjan on Oct. 24, 28 (the latter having been published on MPS 2894 as one of two objects that were both erroneously identified with 1998 UD19) and Nov. 26. The resulting orbit was very cometary in form, with a period of 9.6 years. Furthermore, he recognized that the object had made an extremely close approach (< 0.01 AU) to Jupiter in Oct. 1971, with additional approaches to 0.5-0.7 AU in both 1983 and 1995. 1998 W1 P/Spahr 2 Timothy B Spahr of the University of Arizona discovered another comet on November 16.4 on CCD images taken with the Catalina Sky Survey 0.41-m f3 Schmidt. It is 16th mag and there is no visible tail, with the round coma 18" in diameter. [IAUC 7052, 1998 November 17]. The preliminary orbit suggests that it will reach perihelion in February and may brighten another magnitude. 1998 W3 LINEAR The LINEAR Team discovered an object that had unusual motion on November 25.3 and placed the information in The NEO Confirmation Page. On reporting astrometric follow-up, G. Hug, Farpoint Observatory, Eskridge, KS, noted the object's appearance was probably cometary, a point confirmed by other observers on request from the Central Bureau and by the near-parabolic retrograde orbit, which shows it to be a distant object that will get no brighter than its current 16th mag. [IAUC 7063, 1998 November 28]. Fortuitously, this object was located only 4' from the result of integrating forward from 1939 the orbital elements by Brian Marsden on MPC 6815. Further LINEAR observations were made on Nov. 24. On observing the object with the 1.8-m reflector at the Dominion Astrophysical Observatory on Dec. 6.3 UT, D. Balam noted (in FWHM 3".1 seeing) an 8" coma and a tail extending 18" in p.a. 260 deg. On Dec. 7.1 W. Offutt, Cloudcroft, observing between clouds, also remarked on a tail (or antitail) extending 17" in p.a. 257 deg, but no coma was noted. M. Tichy, observing in poor conditions at Klet on Dec. 7.9, remarked on a possible 6" coma. The object's cometary nature seems now reasonably assured and it has a period of 9.55 years [IAUC 7064, 1998 December 7]. 1998 X1 P/ODAS The Observatoire de la Cote d'Azur-Deutsches Zentrum fur Luft und Raumfahrt Asteroid Survey (ODAS) discovered an 18th magnitude comet on December 15.17 with the 0.90-m Caussols Schmidt camera. The orbit is probably short period, but is currently rather indeterminate [IAUC 7067, 1998 December 17]. 1998 Y1 D/LINEAR LINEAR discovered another faint comet, possibly of short period, on December 22.31 [IAUC 7072, 1998 December 24]. It however was not recovered and is presumed lost. 1998 Y2 P/Li Weidong Li, Department of Astronomy, University of California at Berkeley, reports his discovery of a comet in the course of the Lick Observatory Supernova Search (cf. IAUC 6627; with the participation of M. Papenkova, E. Halderson, M. Modjaz, T. Shefler, J. Y. King, R. R. Treffers and A. V. Filippenko). The object was found automatically by the Katzman Automatic Imaging Telescope in the field of NGC 1041, but it was immediately recognized as a comet by Li, who then used the equipment to make a deliberate confirmatory observation, as well as follow-up observations on the following night. [IAUC 7075, 1998 December 28]. The comet is periodic with a period of about 15.2 years. The Northumberland refractor is the telescope that was used in the search for Neptune. It now has a 0.30-m f18 doublet lens which gives a stellar limiting magnitude of around 15 at the zenith on good nights. The Thorrowgood refractor was built in 1864 and has a 0.20-m f14 doublet lens.